This is a new e-book by professional coastal landscape photographer Christopher O’Donnell. After college, he returned to the coast of Maine to pursue his love of landscape photography and have made it his career. Maine is one of the few states that is relatively untouched by human interference, which makes it the perfect landscape. In The Art of Color Processing: A Guide to Creative Development in the Digital Darkroom, Christopher explains his color processing workflow in a step-by-step fashion, guiding you through each stage from start to finish. In addition to learning the details of his processing, he also discusses the history of his creative development and what led him to discover his own techniques. These important milestones in his photography can direct you towards the development of your own unique color workflows, and provide the key to unlocking the full potential of your creative connection for unlimited possibilities. 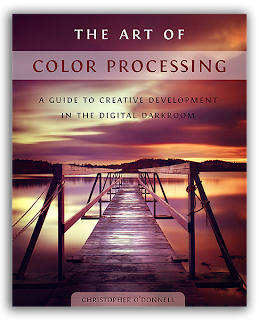 This eBook is divided into three sections, with each contributing an important part to not only learning Christopher's colour processing workflow, but also how to develop your own techniques in the digital darkroom. Section 1 discusses his philosophy on digital processing and the steps that led to the development of his color workflow. You will have your own path to travel in your creative journey. By learning how his techniques came to fruition, you can identify some key turning points while also shedding some light on any potential obstacles. 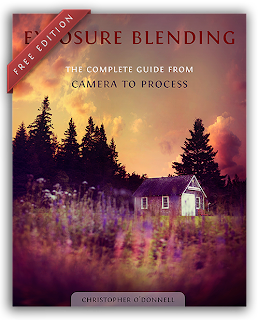 Sections 2 and 3 explain the specific workflows of Christopher's editing and color processing in a step-by-step format. He discusses his techniques and why he chose them, and you can see the evolution of his images from RAW format to the final presentation using screenshots from Adobe® Photoshop CS6 software for visual instruction. Also included is a complimentary 30+ page eBook on exposure blending, which is a method Christopher uses to achieve a proper exposure. Processing in the digital darkroom will be more successful when you capture the entire tonal range of a scene, and this free guide will show you how to achieve the best possible image – from auto-bracketing in the field, to combining different exposures in Photoshop CS6.